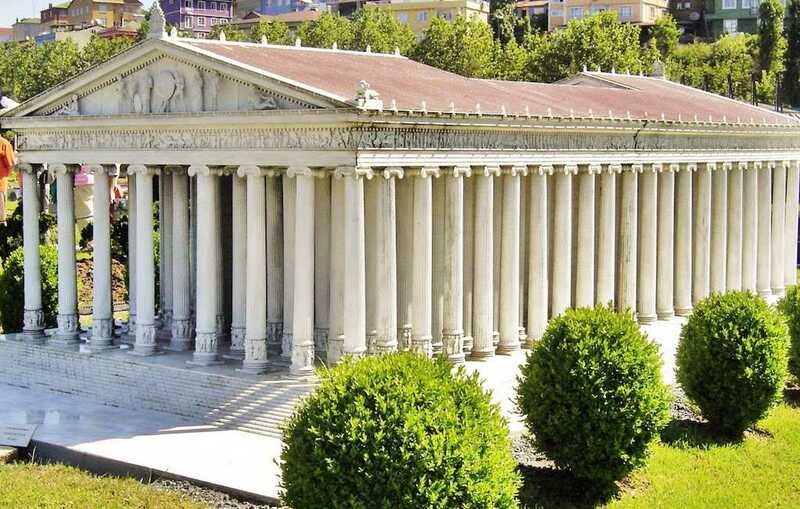 One of the seven wonders of the ancient world called Artemis temple is about 1km away from Selçuk down town on the way to Kusadasi. It situates on the right hand side of the bottom gate of Ephesus which is near Selçuk town’s museum in ruins. One of the Olympians ; as the daghter of Zeus and Leto and a sister of Apollo, healing and sun god according to the Greek mthyhology. Artemis and Apollo were the twins borned at the same time as a sister and brother. 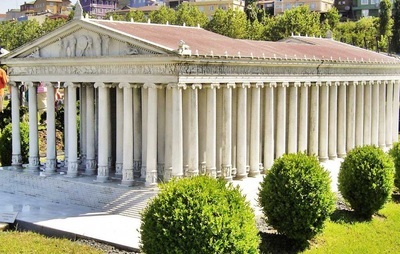 Both of them had the great temples in ancient Greece and Roman provinces in the long history. 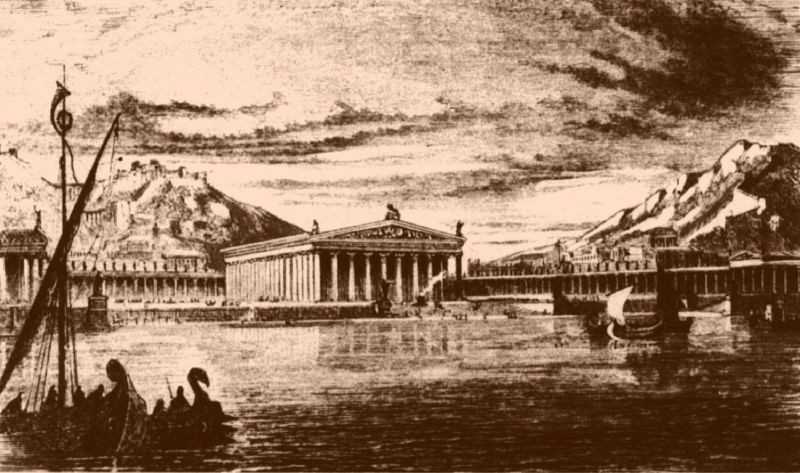 In honour of Artemis many temples both in Greece and Asia minör had been built for centuries but the temple in Ephesus is the biggest and the most beutiful one dedicated to her. Artemis, was the goddess of chestity, fertility and wood. She was also the moon goddess and virginity. She was the savor of hunters, soothsayers, nymphs and muses. She walks in the woods and forests with Nymphas and all animals respect to her. She was the goddess of fertile ladies so before getting married, virgins used to come to her temple, sacrifices an animal depending her richness and prays for a ll her “good marriage. Artemis is described as a hunter and there are the bow and arrows on her chest. She is known as “ Artemis “in Greece and Romans call her “ Diana. Deer is her symbol and the bear helps her. It is accepted by the historians as one of the seven wonders of the antiquity. 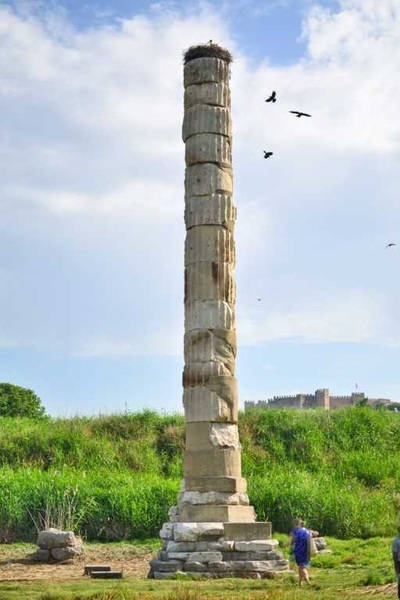 It was supposed to be completed about 550 BC by the order of famous Lydian king Coresos and it was dedicated to Greek goddess Artemis. Then the temple became as the center of the pagan world till the time of Christianity. Pagan visitors all over the world used to come to Ephesus to visit this temple. It was the big income source of the city treasure. Anybody coming to Ephesus, He calls first in commercial agora in Ephesus, he purchases a silver image of Diana temple, he brings and leaves to the responsible priest and then sacrifies an animal. The ceremony is held in the holy atmosphere by pagan priests so he is effected easily and tells what he wants and waits the respond. This systems created a huge touism industry to invite millions of the pagan believers to visit Artemis temple for about 1000 years. Artemis temple used to have 127 high columns of which thirty-six of them sculpted with the freezes and gifted to the temple by the neighboring kings. The temple was about 250m long and 75m wide and the columns were in 33 m. in length.The area used to be a marshyland and got dried by coal and the constrcution took about 83 years to be built.It still covers a huge area and all precious stones, jewellery, gold coins and treasures were kept in the cella, back treasure office, by the priests who they werehe richest people of Ephesus. The temple was also noted for as the federal reserve-Centrl Bank of Asia- throughout the ancient world. The investors whom they left their valuables to the temple, as the safe hands of the Artemis, could be given 5 % annual rate as the gift. 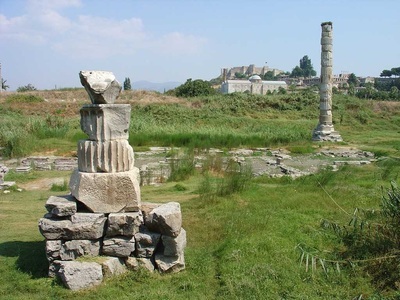 The money from investors used to be credited to the merchants in Ephesus and the merchants could pay 7 % to the priests working in the temple. 2 % in between was the priests’ profit so it was robbed and fired several times. 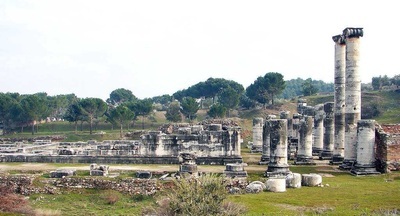 In Roman times everything was great during the 1st C BC, but there was a great threat during Paul’s stay in Ephesus. Before Paul came to Ephesus, silvesmiths were making the fortune by selling Diana images to the visitors, but when Paul was in Ephesus, whenever he awas with the crowd and his followers, he used to begin his words saying “ Gods by hands are not the gods at all, they are hand made or man made gods.These words stopped the buisness in three years and nobody wanted to buy silver images of Artemis temple. Temple of Artemis or Roman Diana was destroyed by the Gots in 282 AD and the marble columns were used to make another structures in Byzantine period. In 434 AD, John the Crysustom, destroyed the satan’s seat in ruins. Byzantines used the marble colums to make churches, Selçuk and Ottoman Turks used them to make mosques in later centuries. 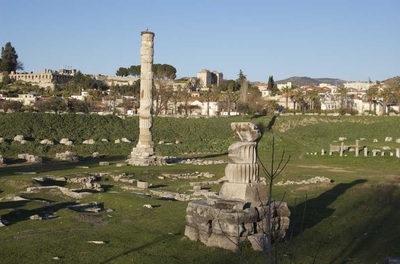 The last and final columns in green were taken out illegally by Bristish archeologists before the World War I and now they are on display in Bristish Museum in London. Unfortunately there is semi column left in the place of the temple as if saying.” I was burnt, I was destryed and I was robbed.